The gathering swallows are set to leave, mist hazes the bright morning hills, the sun has lost its fierceness, and the grapes are fattening on the vines - once again it's autumn, perhaps the loveliest season to be here in the Marche. Casciotta d'Urbino - one of the region's handful of officially protected DOP regional foods - is a delicate pale cheese made from both ewe and cow's milk (around 70% and 30% respectively) across Pesaro & Urbino province. Reckoned to be one of the country's oldest traditional local food products still widely found, it was a firm favourite of Michelangelo in the 1500s. If you find local pecorino has too strong a flavour, the sweeter taste of casciotta might be a good alternative. One of Italy's oldest sagre, or festivals, dedicated to the grape harvest takes place at Cupramontana in the heart of Verdicchio wine country in early October. The event runs from Thursday 2 through to Sunday 5 October this year and features a parade of decorated floats, a contest of bare-foot grape crushing, traditional saltarello folk dances, and plenty of chances to try local wine and food. An excellent reason to visit the white truffle festival at Sant'Angelo in Vado any weekend in October - apart from the obvious one of eating tartufi - is to visit the Domus del Mito, or House of Myths, the remains of a 1st century AD Roman villa with some 1,000 square metres of elaborate, polychrome mosaics. Only relatively recently discovered, these remarkably well-preserved mosaics represent some of the finest ancient Roman discoveries in central Italy over the last half century, but are rarely on show to the public; the annual Mostra Nazionale del Tartufo Bianco Pregiato each weekend from Saturday 11 October provides one of the few occasions when they can be easily viewed. 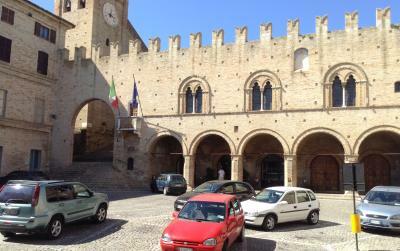 This month's image of one of the region's piazze, or town squares, features the fine compact square at Montecassiano in Macerata province, watched over by the swallowtail crenellations of the Palazzo del Podestà. Here are reminders for two annual food festivals worth visiting this autumn. In Senigallia, Pane Nostrum runs for four days from 18 September, and includes stalls selling artisan breads from across Italy, demonstrations of bread making, and tastings. Meanwhile at Fano, for three days from 12 September the Festival Internazionale del brodetto e delle zuppe di pesce celebrates the Marche's famous fish stew, and other forms of fish soup. 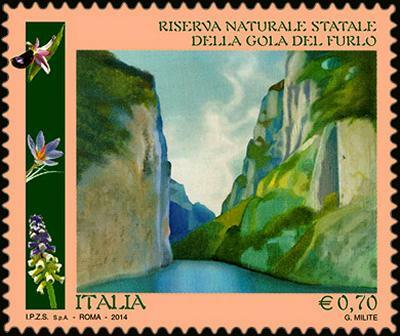 The Italian post office, Poste Italiane, has issued a stamp featuring the Furlo Gorge nature reserve in the northern Marche as part of a series celebrating parks and gardens in Italy; the large format stamp has a face value of 70 cents. 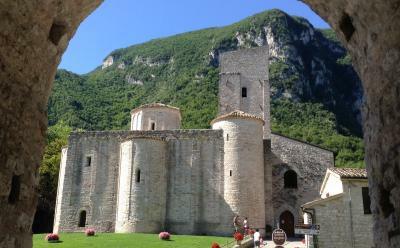 There is still plenty of time to catch the major exhibition of high medieval art in Fabriano, Ancona province. Entitled From Giotto to Gentile - Painting and Sculpture at Fabriano from the 13th and 14th Century, the exhibition runs until 30 November 2014. The small Romanesque church at San Vittore delle Chiuse in the Frasassi Gorge was built in the 12thC on chastely simple lines and is one of the prettiest of its kind in the Marche - well worth hunting out if you're visiting the nearby Frasassi caves. A spirited production of Mozart's glorious Don Giovanni by the celebrated British opera director Graham Vick opens the annual opera season at Jesi's Pergolesi Theatre on 4 and 5 October. Puccini's Tosca and Offenbach's The Tales of Hoffman complete the season. The Marche's population of 1,559,542 represents just 2.6% of Italy's total population. This newsletter is only sent to people who have personally subscribed to it through the Marche Voyager web site. If you do not wish to receive further issues please unsubscribe here. Alternatively, please e-mail us giving the e-mail address to which this newsletter was sent and "unsubscribe" in the message subject. You are subscribed at [EMAIL] . We appreciate feedback - any comments, suggestions, criticism or praise gladly received; E-mail us here.